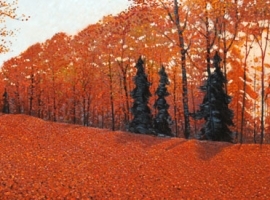 From an early age, Mark Berens has been immersed in the world of painting, as both of his grandparents were artists. He still recalls fond memories of the oily scent of his grandmother’s studio space. Berens started experimenting with oils during his first year at OCAD, and instantly found it to be his choice medium for creative expression. Upon graduating in 1999 with an illustration degree, Berens ventured down the road of editorial illustration only to find himself creatively unfulfilled. He longed for the fulfillment of personal expression, which he knew would slowly evaporate if he continued his career in the illustration industry. Berens longed to hold a paintbrush once again. An inspirational trip to Whistler, BC instantly reconnected Berens with the outside world, and an inevitable passion to paint his natural surroundings. He began a new artistic journey – representing landscapes through oil paint. Since this poignant trip, Berens has traveled to many parts of Canada in search of picturesque scenes that would in turn inspire new landscape pieces. Now showing with galleries all over North America, Mark Berens happily works as a professional artist whose works adorns the walls of many fond admirers.